As well as showing some of the limited play features in the set, there’s confirmation that minidolls look ridiculously tall in flippers. Let’s hope it doesn’t become the next new fashion trend. As this is a quick review, I’m only going to show you what I think are the most interesting and appealing parts in the set. 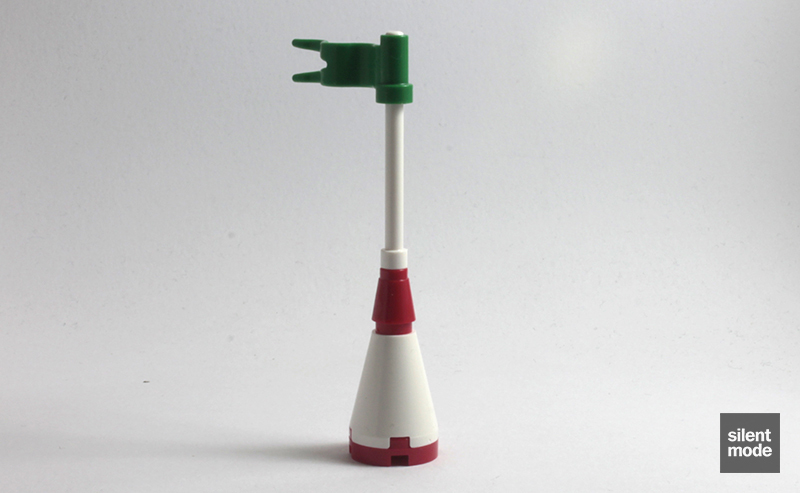 Making a return from the Collectible Minifigures series is the lifeguard floating device, made famous by the S2 Lifeguard. 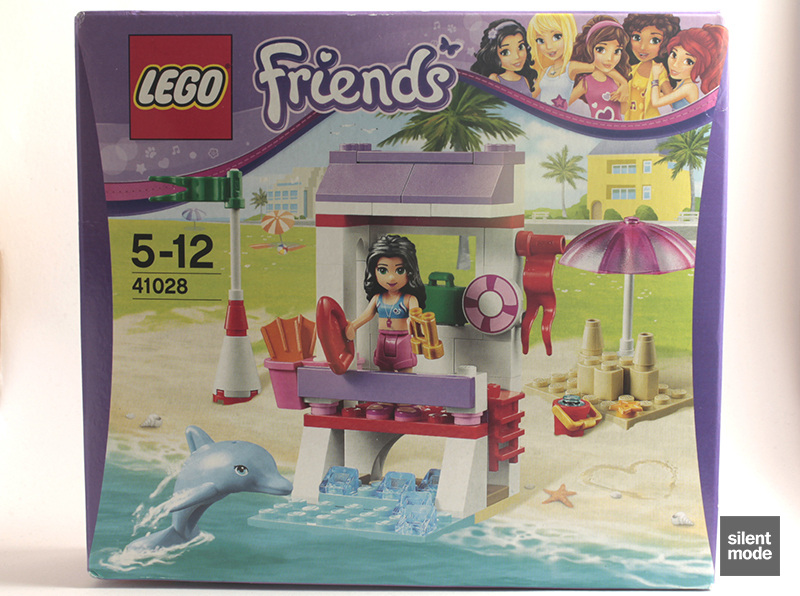 We also have a couple more star plates from other Friends sets, as well as another appearance of the Bright Light Blue dolphin (also seen in Dolphin Cruiser). The life preserver printed tile uses the new mould for the 2×2 round tile (the one with the stud holder in the middle). Finally this set is one of only a handful where you’ll find the Green suitcase, 1×1 round tiles in White and the Trans Medium Blue cheese slopes. One part I didn’t notice until further along in the build were these brand new ones: 1x1x3 bricks. This counterpart to 1x1x5 ricks seems to be meant for structural purposes (i.e. 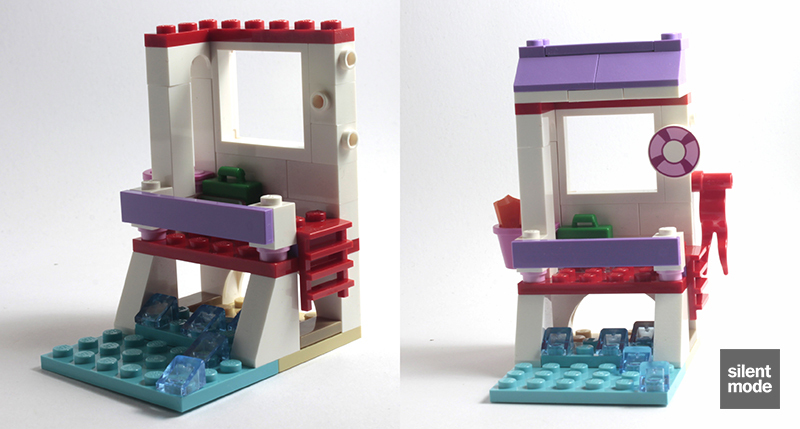 placed next to window frames), and can be found in White in a couple of other 2014 sets: City’s Prisoner Transporter and Cinderella’s Romantic Castle. We’ve seen Emma in swimwear before, but this is her first time in a bikini, and so far her only appearance in flip-flops. For some reason she comes with a Magenta bow, which isn’t something I remember lifeguards having. Then again, she did have one while practising karate. With her 24-carat gold binoculars and her lifeguard float, she’s ready to save the lives of countless young men pretending to be drowning – but she’s gotten wind of this phenomenon, and enlisted the help of a carnivorous dolphin. A very simple sandcastle build is the first thing you’ll tackle, and it looks an awful lot like sandcastles you’ve seen before in other sets. This time the star plate represents a starfish. Even this flag is always happy to see Emma. Either the post is very close to the water, or we’re at high tide – but this is where Emma hangs out during her lifeguard duties, keeping a close eye on the beach. A Dark Pink basket holds a pair of useless Orange flippers on one side, while there are spaces (provided by SNOT bricks) for the flags and the life-preserver on the right. The Green suitcase hosts one of the White 1×1 round tiles, which I’m guessing is meant to be a first aid kit. 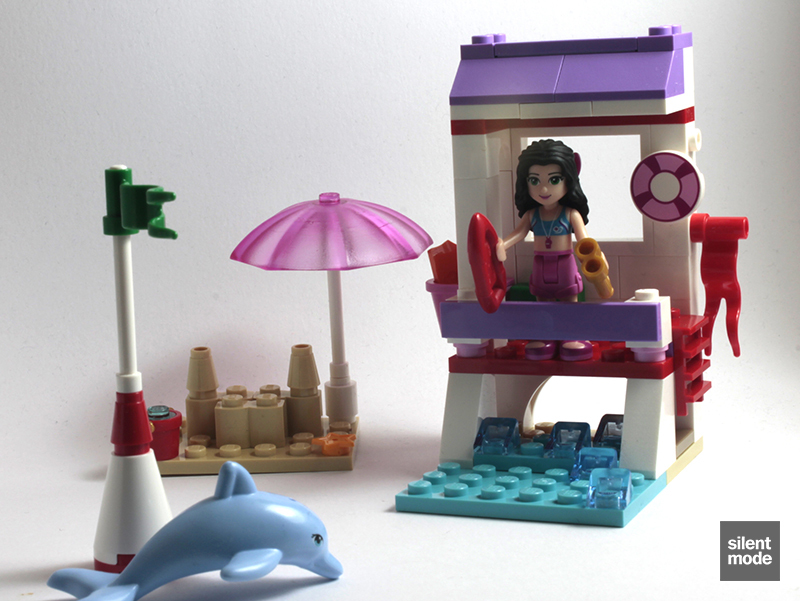 Within minutes you’ll be recreating Flipper, Baywatch or whatever beach-themed television show from yesteryear you like. Should something happen to the dolphin, Emma doesn’t have to use the ladder – she can dive right in. As usual we get spares of all the tiny parts, but we’re blessed with two golden binoculars: another potentially valuable part for steampunk MOCers. I would have the post a lot closer to dry land myself, but what do I know about lifeguard duties? A very simple build throughout, with a slight sense of déjà vu. Good for useful parts: the least expensive set (currently) you'll find the new and potentially useful 1x1x3 bricks, as well as the Trans Medium Blue cheese slopes. 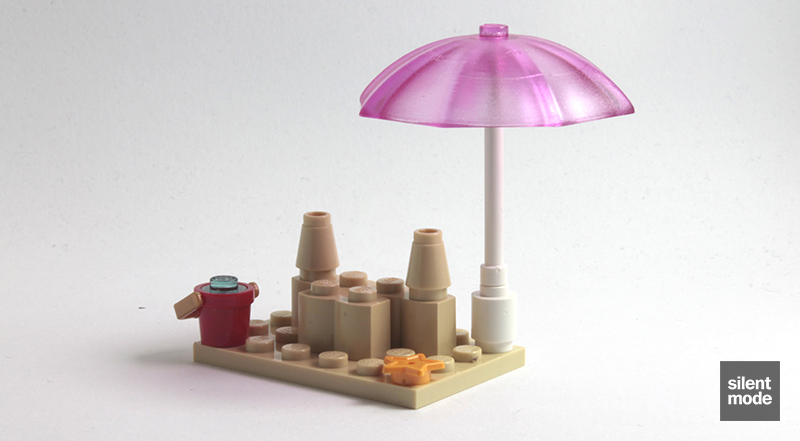 This set would be great for setting up a beach scene, and works whether you have one post or several. I couldn't see myself playing with it all day, however. Worth the price of entry for the unique Emma minidoll, and the dolphin (obviously the premium part) if you don't want to buy Dolphin Cruiser. I’m giving this set 6.8/10, and I have yet another minidoll to add to my collection.